I devour books whole, swallowing them in one mouthful. Most people take in books slowly, savoring them page by page, drawing out the stories over the span of days and weeks as they pick them up for an occasional hello. Some days I wish of a world where stories could travel farther through time, the sentences stretching over hours instead of seconds. My impulsive nature dictates otherwise; falling hard and fast for a narrative, it refuses to put it down until the final page has been turned. I wish I could make the stories last longer. I wish, in so many ways, they would never end. They always do, they must, but there is an endless supply reaching out to take the next place. When I pick up a book, I expose my soul to it, allowing it into my most vulnerable and unguarded corners in a way I struggle to do with people. I live vicariously through the characters, experiencing their highs and lows, swept up in the journey of self-discovery. Even so, the end of a good book jars me. My heart is so consumed with emotion and the story told that I find it difficult to adjust back to reality for a moment. I want to share this experience with those around me. I want them to feel as I do in that instant, somehow both shattered and whole. Instead I keep the quiet moment to myself and pass the book along to them, hoping they will find the same experiences as I did. Last weekend, on a long car ride back from the mountains, I picked up Cheryl Strayed's Wild. My eyes were glued to the page as Cheryl took me through her journey. While I wish to speak about this book in great detail, it is simpler to tell you that there are many books worth reading and this is one of them. And so, I pass the book on to you. Just as I have a fondness to revisit favorite books, I like to do the same with recipes. While many recipes can stand alone, I like to give a few of them a bit of a tweak now and then, to steer the recipe on a new course of its own. When I found myself with more pita bread than a lone woman should eat, I cut it into slices, spiced it, and baked it until crisp. 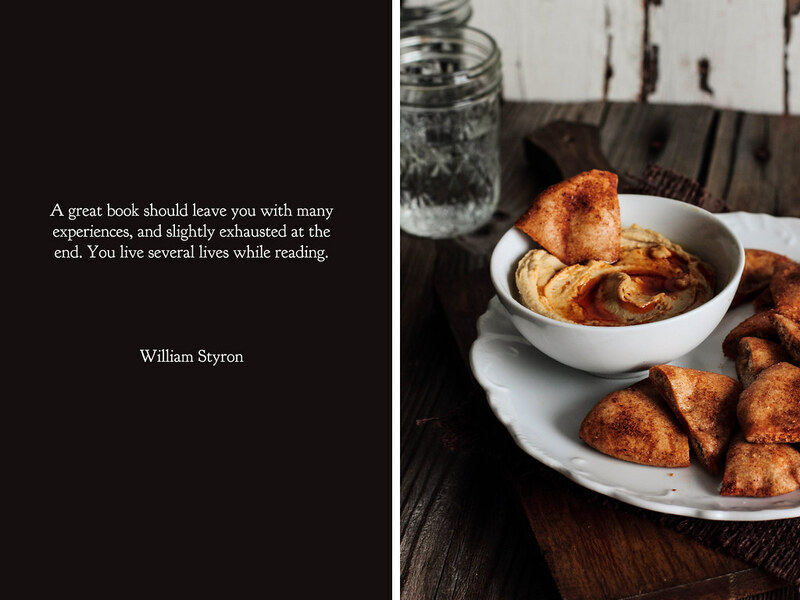 As I dipped my fresh pita chips into a bowl of hummus and paged through a magazine, I wondered whether the experience of eating a good dish was similar to reading a good book. 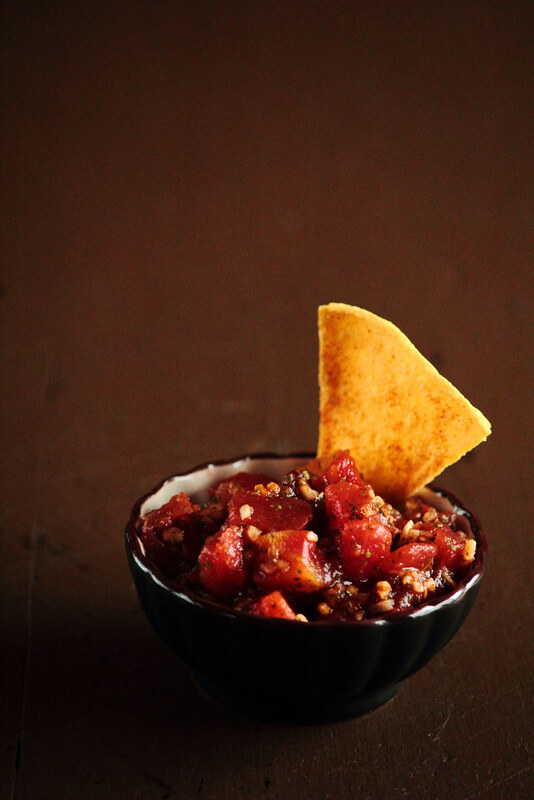 Food takes me through a journey of the senses, of memories, of nostalgia, and, in a few instances, of self-discovery. While most foods and flavors I enjoy are a part of the everyday scene, there are a few that stick out in my mind. As great books, these recipes have carved a place in my heart. I find myself longing for more after the last bite is gone, grateful for the experience, wishing I could share the moment with you. 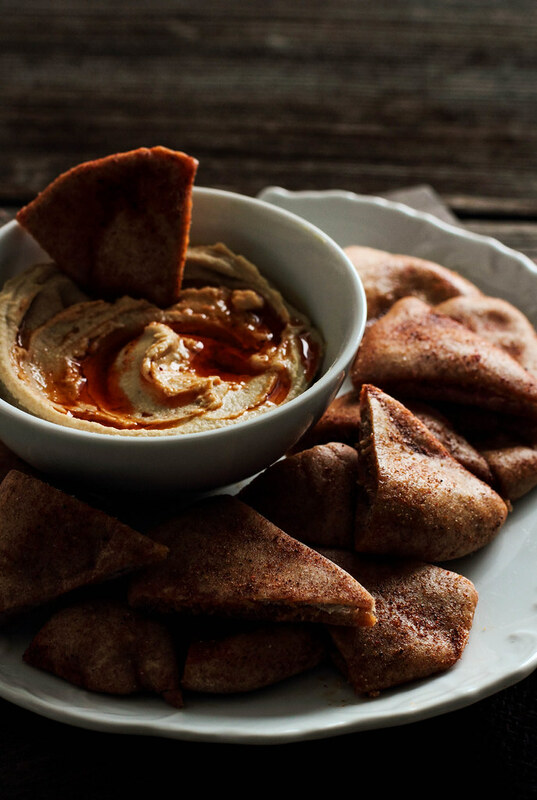 Homemade Pita Chips are spicy, addictive, and perfect for snacking. 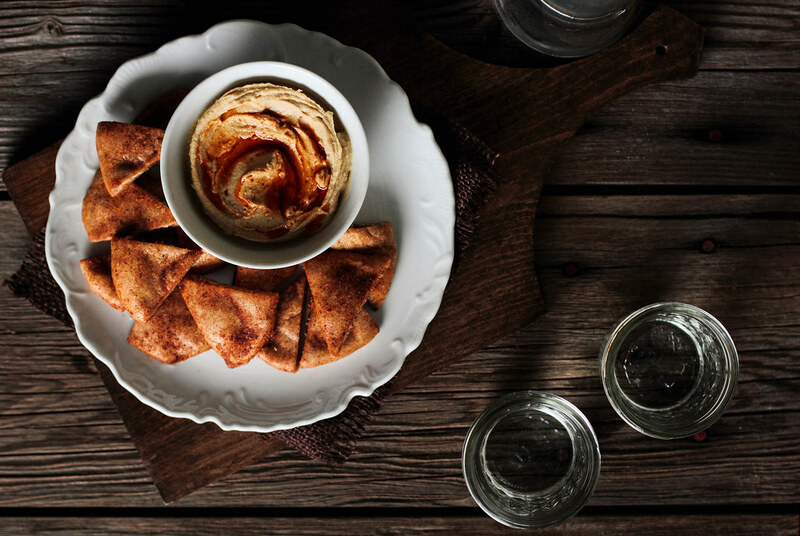 Pita bread is brushed with a layer of oil, cumin, and chili powder, sprinkled with salt, and sliced into bite-sized pieces. The chips emerge from the oven browned and crispy, ready to be dipped into a bowl full of humus. 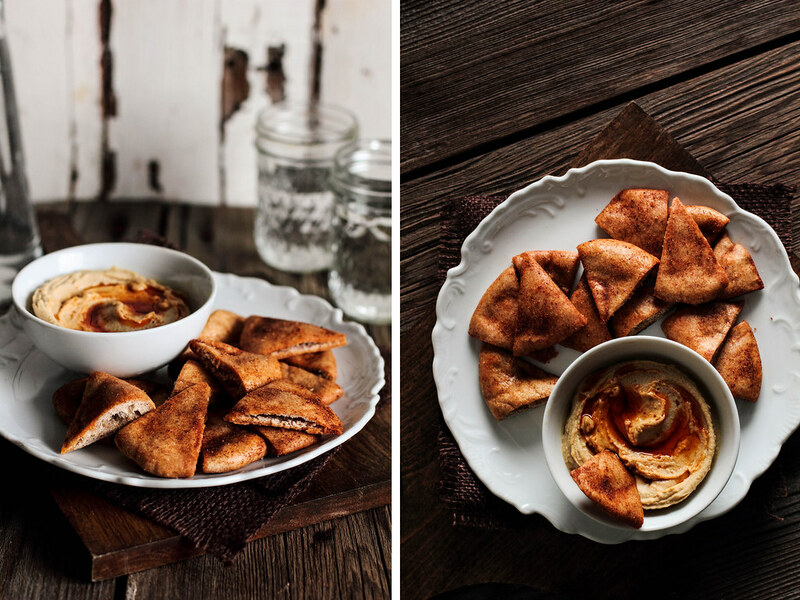 While I used homemade pita bread for this recipe, store bought pitas will work just as well. A fair warning, however: you may find it difficult to share. I grew up eating baked corn tortilla chips. My mother made them purposely whenever she served up chicken tortilla soup. She seasoned them with a dash of salt and served them crisp and hot, fresh from the oven. We used them to scoop up the soup, rarely needing to pick up our spoons. The first time she made them I was in awe. Though I eat tortilla chips all the time, I never made the connection between the chips in the bag and an actual tortilla sitting on a baking sheet. You could say it was a revelation of sorts. While this may be a new idea to some of you, for others it is a reminder that you can and should make your own corn chips. 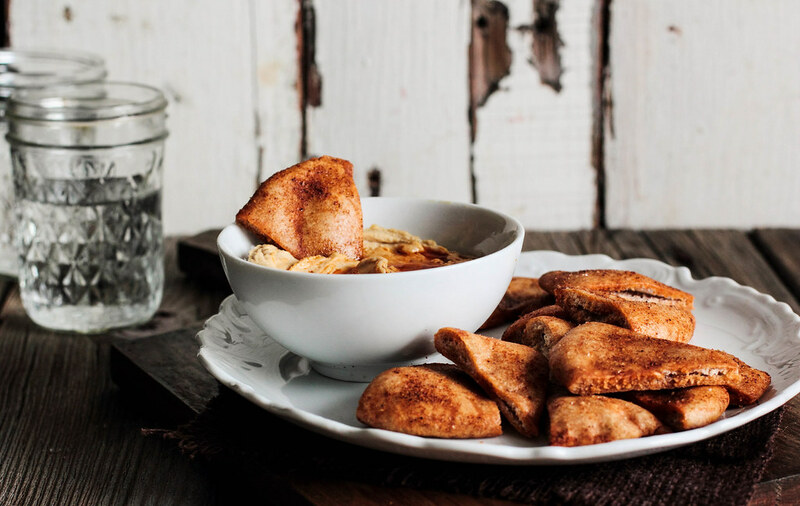 They can be made sweet with a dash of cinnamon and sugar or savory with spices and herbs. I made three different types of chips when I set out to bake them yesterday. The first were made with a light sprinkling of salt and a dash of freshly grated Parmesan cheese. The second group I sprinkled with a few dried Italian herbs. The third group of corn chips was seasoned with dash of seasoning salt (Lawry's brand). Though these are just a few ideas, I imagine that freshly cracked pepper would go perfectly on just about everything. Be careful when seasoning the chips, however. A little salt goes a long way. While I enjoy them with a bowl of chicken tortilla soup, they certainly wouldn't go amiss with a bowl of hot and hearty chili. 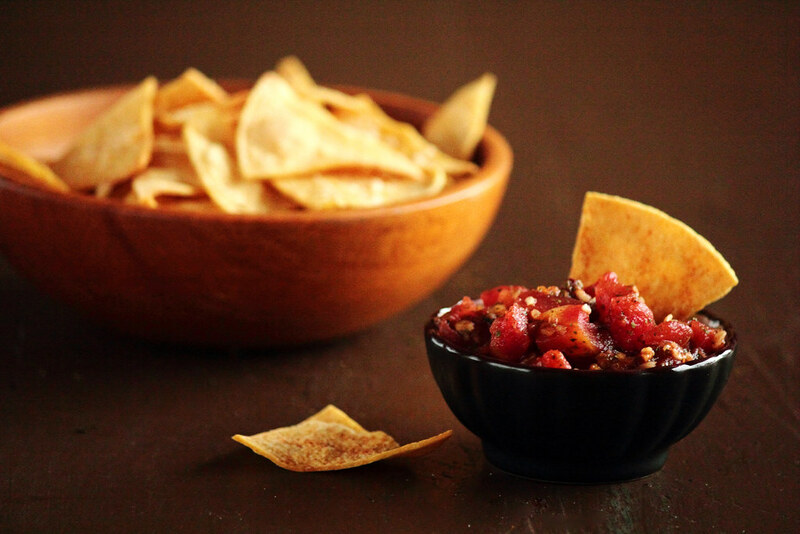 These tortilla chips are also lovely dipped into a dish of homemade salsa or a warm pot of spicy queso. You may be having a Super Bowl party, looking forward to the big game to cheer on your favorite team. Or you may be in my shoes, excited for chips, chili, and sitting down to the best commercials of the year. Whatever end of the spectrum you fall, I hope you enjoy your evening and definitely eat your fair share of salsa. 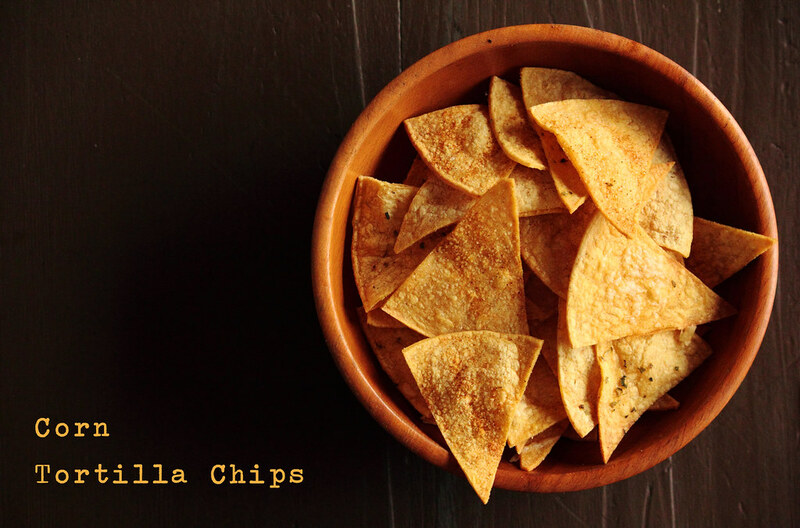 How would you personalize your corn chips? 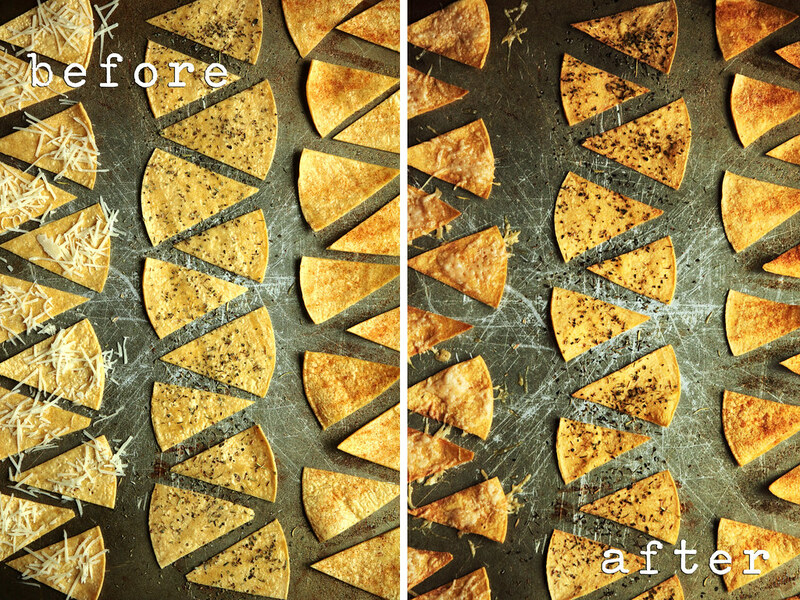 These Baked Corn Tortilla Chips are crunchy, fresh, and come straight from your oven. They are easy to make—simply cut a corn tortilla into strips or pie wedges, lightly spray with cooking oil and season however you please. After spending a few minutes in the oven, they come out crisp, hot, and ready to eat. Not only are these chips healthy because they are baked, but they are equally at home near a bowl of dip or a bowl of soup.